Does adding multi-touch make Samsung's laptop-focussed screen worth the money? Has the touchscreen revolution got far enough to need this monitor? If Windows 7 on a touchscreen was any good, this monitor would be extremely desirable. But it isn't, so it stays in the 'good' camp. Got a desktop-replacement laptop and fancy adding a second display in dual-monitor mode? Then the Samsung LD220Z Lapfit Touch is quite literally for you. 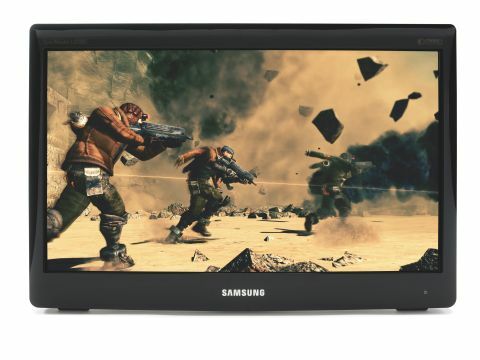 It's a 22-inch Full HD screen specifically designed to work well with portable PCs. That's not all. As the name suggests, this monitor also has full multi-touch functionality. In fact, it doesn't even need special drivers. Simply connect via USB to any Windows 7 PC and the touch capabilities are enabled. What it's not, however, is a high fidelity screen thanks to its TN LCD panel. Of course, the combination of the funky, laptop-friendly form factor and touch capabilities puts the Samsung LD220Z Lapfit Touch in a category of its own. It also lifts its price well beyond that of the vast majority of 22-inch monitors with TN panels. In fact, at around £225, it's more expensive than many 23- and 24-inch panels, including BenQ's VA-panelled EW2420 and the LG E2350.